Habitat: Desert (upper elevation), Upland. 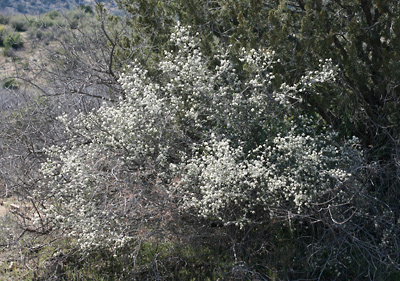 This plant grows on dry, sunny slopes, usually in oak-juniper woodlands and chaparral. Description: The flowers are in dense, rounded clusters. The individual flowers are small and have 5 white, spade-shaped to manta ray-shaped petals, 5 white, folded-up, triangular sepals, and 5 stamens. The flowers are followed by round, green drying to brown seed capsules. The leaves have only one major lengthwise vein and are small, thick, leathery, dull dark green above, more velvety and paler below, opposite, oval to egg-shaped, and usually cupped. The branches are spineless and silvery gray to reddish gray in color. The plants are well-branched and erect or rounded. 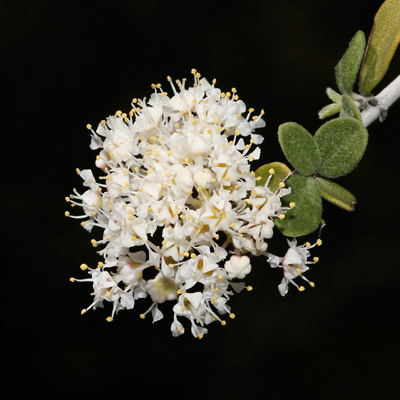 The very similar Fendler's Ceanothus (Ceanothus fendleri) is usually found at higher elevations and has spine-tipped branches and leaves with 3 major lengthwise veins. 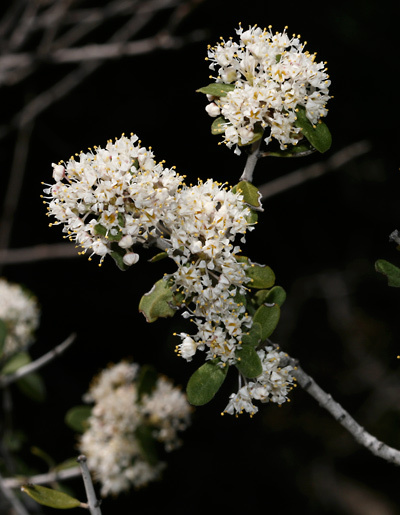 Fragrant – The flowers are very fragrant and perfume the air near the plants.